There’s a lost of myths surrounding mattresses out there. Make yourself a better consumer by familiarizing yourself with them. When it comes to buying a new mattress, everyone has their own strategy and approach to getting the support and comfort they need for a restful sleep. However, there are some mattress myths that many people have fallen victim to without even realizing here. Check out this list of myths about mattresses you should avoid falling for. Many consumers believe that a firm mattress is the best solution for sleeping with a bad back. It’s rooted in the idea that, if the mattress is firm, it will be more supportive and therefore, help relieve the strain and stress on your bones and joints while you sleep. While firm mattresses might be the answer for some, it’s not an overall cure-all. In fact, the best option for sleeping on a bad back is a mattress that conforms to the shape of your body. Firm mattresses are supportive, but they could result in pressure point pain. Mattresses that conform to your sleep position will provide equal amounts of comfort and support. There’s a myth that’s been around for years that suggests that mattresses should be flipped every few months to keep them in the best possible condition. In truth, most mattresses are designed for one-sided use and should never be flipped. 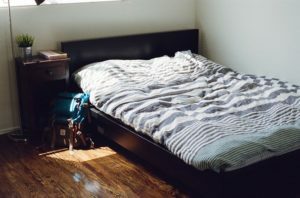 Instead, if you’re concerned about your mattress compressing evenly, you should rotate it instead. Use a system of rotating your mattress once a month for the first six months and then once every three months. For sleepers that want to stop tossing and turning, there’s a myth that suggests that buying the right type of mattress will help stop all that movement. The truth is that most adults move as much as 75 times throughout the night. No matter what type of mattress you purchase, you won’t necessarily stop tossing and switching positions. Most sleepers move to alleviate pressure point pain from being in one position for too long. Tossing and turning is healthy and helps relieve stress on the body. This entry was posted on Friday, August 3rd, 2018 at 1:06 pm. Both comments and pings are currently closed.